19.19. Sounds like a year from the WWI history books. 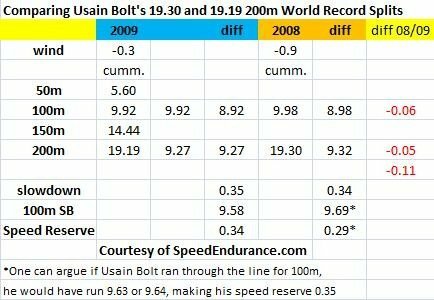 What is the take home message, when you compare this with his 19.30 from Beijing 2008? (1) The faster your 100m time (speed), the faster your 200m can potentially be, with a faster opening 100m (speed reserve) taking the curve in consideration. (2) Everyone slows down the second half of the 200m. Training the speed endurance components (and to some degree, special endurance) will improve this part of the race. His Speed Reserve is 9.58 – 9.92 = 0.34 seconds, with the curve in consideration. 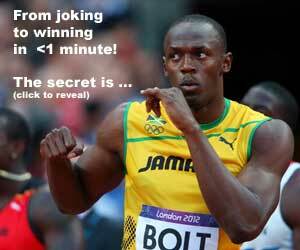 Therefore his slowdown is 9.27 – 8.92 = 0.35 seconds. The above chart shows a similar execution from Beijing’s 19.30 200m. Compared to Michael Johnson’s 19.32 from the 1996 Atlanta Olympics, his splits were 10.12 + 9.20, so Johnson still has the fastest second half ever recorded. You will never run the first 100m all out (hence the speed reserve), plus there is always a slowdown over the final 100m straightaway (hence the speed endurance training component). My theoretical calculations for 100m and 200m is doubled your best 100m time +/- 0.2 seconds. This is a good indicator on what you need to improve on the respective events, or to determine which is your “better” event. 19.16 +/- 0.2 = 18.96 to 19.36 range. That being said, there is potential improvement on the current WR. And how about ideal win conditions? Pretty scary, don’t you think? Adjust for reaction time and we get to compare the 6/100ths (0.056s) difference between the 1st halves of the beijing & berlin 200m runs. controlling for elevation, temperature beijing & berlin are similar enough. 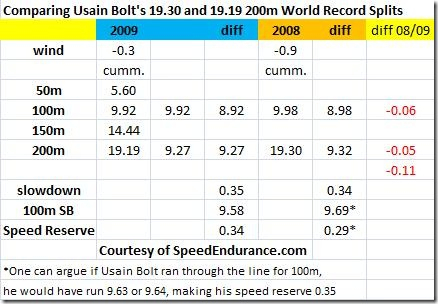 5/100ths (0.049s) of the 6 100ths (0.056s) difference between the 2 runs can be explained by his lousy start in beijing. If you accept the data is accurate to the 1/1000th’s than the difference is only 7/1000ths. effort wise ignoring RT his beijing @ berlin runs are extremely consistent they’re virtually indistinguishable.